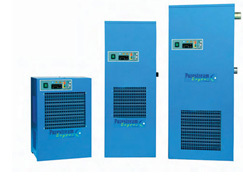 The Purestream AHT range of high temperature refrigerated compressed air dryers have been designed to provide a controlled, economical supply of dry air to the point of application. For high temperature applications this dryer is designed with a built-in air cooled after-cooler, moisture separator and drain in an all in one compact spacing saving design. As an important source of energy within all industrial sectors, many processes depend on high quality compressed air to prevent costly downtime, machine damage and product spoilage. This new dryer design features a highly efficient cooling module which has a direct effect on reducing energy consumption and pressure drop. The main advantages are: low pressure drop even with load variances and a constant pressure Dew Point with differing load conditions. The AHT range is supplied with a host of features which include an after-cooler, moisture separator with drain, vertical aluminum heat exchanger, industry leading hot gas by-pass valve, electronic controller with dew point read out and no air loss Bekomat drains as standard. The AHT range is approved for use and available in every voltage and can be used anywhere in the world.